How can something be fixed, unless it was first broken? How can someone be healed, unless they were already wounded? How can something get better, if it is already the best that it can be? In Finding Healing in Brokenness, a young woman is forced to confront her imperfections and greatest fears. 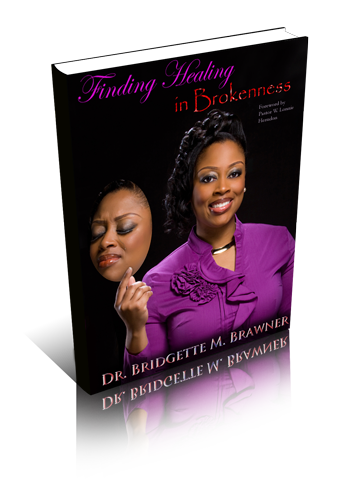 Dr. Bridgette M. Brawner—an accomplished woman in her own right, obtained degrees from top universities, yet wrestled with the pain of unresolved childhood trauma, emotional disappointment, near-death experiences, and shattered dreams. Frustrated and at the end of her rope, Dr. Brawner realized that she could not fill a “God-sized need” with man-made solutions. As it is written, “Let perseverance finish its work so that you may be mature and complete, not lacking anything” (James 1:4). She discovered that true healing—and an opportunity to finally become whole—would only come by submitting her brokenness to the Holy Spirit and persevering as she faced decades of open wounds. In this thought-provoking page turner, the reader travels with Dr. Brawner through chapters of gut-wrenching, real-life testimonies, emboldened by transparency and scripture references. She offers insight into the pain of a troubled soul and extends hope for a saved servant. With each chapter, you will be transformed. With each prayer and discussion question (written to symbolize a bridge to new beginnings), this book will serve as a powerful assault on the spirit of delusion. By the end of this journey, you will obtain more answers than questions, and you will encounter a greater understanding of God’s will and purpose for your life. Is There Anything Too Hard To Forgive?